Big Announcement….Great Relationships Should Feel GOOD! “She is not my friend!” announced my 3-year-old granddaughter as I put her into my car. I must admit, I was a bit confused myself at her outburst of clarity and conviction. See, I had just watched her play with what I thought to be a newfound playmate for over an hour in the McDonalds play land. As she climbed into her carseat, I had to ask, "How do you know she is not your friend?" Now, I need to mention, that besides the conviction in her voice, there was no emotional upset whatsoever. As my hand clicked her carseat strap into place I asked, "Do you feel sad at all about what happened?" "Feel sad about what?” she asked with a puzzled look on her face. “I guess not,” I thought to myself followed by a long pause and some deep thoughts. Wow! Once again, the children in my life "school me" on life and relationships. Just like that, a 3-year-old decided this person was not her friend simply because she did not feel good in her company. There was no other reason needed to justify her decision to not claiming a person as a friend. My granddaughter did not need to come up with a list of horrible, mean things her playmate did or said. It was simply that she didn’t feel good playing with her, so she was not her friend, end of story! I thought to myself, "Gosh, if I could have honored my feelings of intuition just like her in my past, my life could have been filled with more simplicity and ease, and far less drama." I began to think of all the relationships I had been involved with, both lovers and friends that did not feel good; however, I chose to continue to spend my time with those same people! Some of them I even married! And the reasons I used to justify my reasons for doing so, are as numerous as the stars in the sky! What about you? Do you spend time with people in your life that don't feel good to be around? Great relationships should feel good! We have all been given an internal filter, it's called your intuition or knowing. Intuition is that feeling when you just know something and you don't know why you know...you just do! Most times, when we have experiences like the one my granddaughter did, we rationalize them and analyze them away. Essentially, we talk ourselves out of trusting the knowing that makes no sense to our logic. I call these enrollment conversations. Enrollment conversations happen when our logical thinking talks us out of following our intuition. We enroll ourselves into doing something OTHER than what we were inspired to do in the first place. We do this with our life dreams all the time! We dream of being artists, scientists, builders, entrepreneurs...we all get excited about it and enroll ourselves into doing something else because it makes more sense, appears to be more realistic, in spite of our intuition's voice saying, "this is for you, you can do this, go for it!" Our dreams for love get butchered in the same way. Our intuition speaks a knowing to us to pursue or release a lover in our lives, and we enroll ourselves into or out of the relationship using our head inside of our hearts. Have any of you known that the person you were about to promise your heart and soul to was not a good match for you, but you moved forward anyway? I sure did…my intuition told me before I even said “I do,” that I would do well to make a different choice when I married my first and second husbands! I am a slow learner sometimes! Do you have [or have you in the past had] a sense, a knowing, and/or a feeling, about your relationships? Truth is, we all do. Turns out, the challenge is not feeling our intuition, it's allowing ourselves to follow it that is difficult for us. I have some science to share that I hope will finally give you the motivation and courage to develop and trust your intuition in all matters, but especially matters of the heart. By doing so, your trust will grow. Why? Because ultimately, you will be increasing the trust you have in yourself, and the specific information that lies inside of you is ready and waiting to be of service. Advances in technology are proving that intuition is not a woo woo thing at all, but a body thing. Your body has access to more information than your mind can process, and we have not yet even talked about the fact that you also have the ability to draw from your subconscious, and the wisdom we have access to because of quantum physics! Your intuition is YOU accessing your integrated, whole-system experience…this is why you just KNOW! 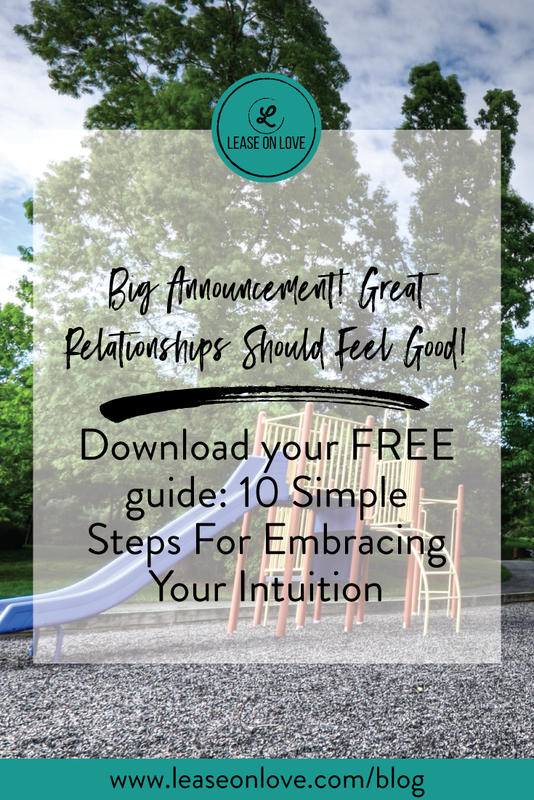 Your intuition is a REAL thing, and I have got to tell you honestly, it will be necessary and so helpful to you when you’re rebuilding your trust in love and relationships if you can become BFF’s with it, and then trust the guidance it provides you. Get in touch with trusting your intuition right now. 1. Intentionally give your intuition a voice, and check in with it. You do this by pausing your thinking, and scanning your body instead. Look for sensations of tightness, nausea, shallow breathing, even a sour taste in your mouth. These could all be indications that you would be better off to avoid whatever it is you are considering. Sensations or feelings that make you smile, feel or see light, excitement, joy, and/or peace, are indications that your considerations would provide a positive experience for you. We all have personal ways that our intuition communicates with us, and it is important for you to discover what it is for you. This will happen as you invite your intuition more and more into your life decisions. Start small. A great place to begin is with your choices of food and clothing. It looks like this: You walk into your closet, and your notice you really want to wear the red dress or shirt for the day. Your thinking kicks in and says…"Oh geez, its so bright and flashy…what will my [fill in the blank] think? You should wear the blue." If you feel inspired to wear the red…wear the red, and watch what happens. 2. Here is another favorite: get a little notebook (a tiny one that fits in your pocket). When you have a feeling about something, write it down. This way, when your feeling turns out to be right later, you can go back and validate that your intuition was spot on! This will give that mind of yours a good reason for trusting your intuition in the future, and build your confidence quickly. Bottom line, we would all benefit from intentionally developing and trusting our intuition. In fact, we simply must if we desire to become successful with love and relationships. When your mind says one thing, and your heart is saying another...try this! Let’s practice following the example of my 3-year-old granddaughter; listen to your internal filter and call it like it is! Want more Lease On Love? Newer PostDo you have the COURAGE to be YOU? Or are you the version everyone wants you to be?